The widely anticipated verdict came in response to Hovannisian's appeal against the presidential administration's refusal to backdate his citizenship to 1991, when he first applied for it. The presiding judge, Saro Aramian, rejected Hovannisian's arguments that his repeated applications were unlawfully turned down by the current and former authorities until 2001 when he finally received an Armenian passport. He announced the decision after a long speech by Artashes Kakosian, a lawyer representing President Robert Kocharian. Kakosian claimed that there are no official documents in the state archives proving that Hovannisian applied for Armenian citizenship in 1991. He said the first such application was properly filed only in 1997. The ex-minister, who would be a major candidate in the February 19 elections, deplored the court ruling, saying that he will appeal it at a higher court. The latter is unlikely to overturn it, however. Under Armenian law, ten-year citizenship and residency in Armenia is a key requirement for the registration of presidential candidates by the Central Election Commission. Hovannisian's failure to secure an appropriate official document would almost certainly result in his exit from the presidential race. In that case, he will likely endorse another major opposition contender. Hovannisian maintains particularly close ties with two of them, People's Party (HZhK) leader Stepan Demirchian and Hanrapetutyun party leader Aram Sarkisian. His election disqualification would also lead the opposition to raise more questions about President Robert Kocharian's eligibility to contest the ballot. 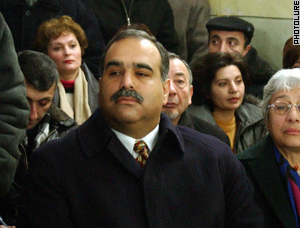 Kocharian, a former president of the unrecognized Nagorno-Karabakh Republic, moved to Armenia in 1997 after being appointed Armenian prime minister. Immigration authorities have nonetheless certified that he has permanently lived in Armenia in the last 10 years.